Stable metal oxides insoluble in acidic medium have been prepared and characterized. The influence of metal oxide (MOx type) on the activity of Pt towards ethylene glycol (EG) oxidation in acidic medium has been examined. 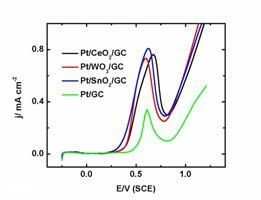 All modified Pt/MOx/glassy carbon (GC) electrodes exhibited a better activity compared to Pt/GC. While Pt/SnO2/GC electrode exhibited the highest activity, Pt/CeO2/GC revealed the best tolerance against poisoning process.